We joined a CSA this summer. 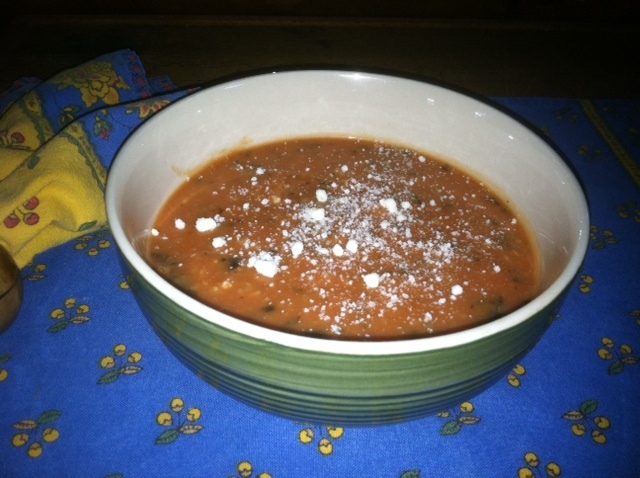 Perhaps you remember CSAs from my earlier post ten-baby-steps-to-natural-living . Anyway, one of our selections this week was kale. Hmmmm? What to do with kale? I tried kale chips a few months ago – back when they were all the rage. Blech! Contrary to numerous Facebooks posts, kale chips are NOT the new Pringle. Anyway, I googled kale recipes, but I didn’t have the right ingredients for any of the recipes I found, so in the end, I did what I often do – I made up my own. 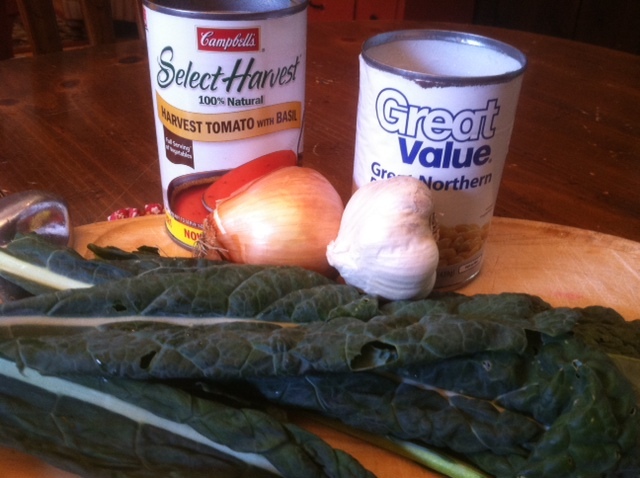 My own kale soup recipe relies on a Campbell’s 100% natural, no MSG, no preservatives, two servings of vegetables in every can, tomato soup. (See how I did that – I can’t just say “canned soup” I have to clarify that I at least use healthy, 100% natural canned soup). I happened to have this canned soup on hand, because I recently discovered The Littles like tomato soup. Since I’ve never made tomato soup, I bought the canned stuff to tide them over until I learned to make it from scratch (eventually someday). I also keep emergency chicken noodle soup on hand even though I do make a really delicious chicken noodle soup. This is in case I get sick and need chicken noodle soup but I’m too sick to make it. Anyway, that’s beside the point, but I’m just pointing out that there is some justification for having canned soup in one’s pantry. Anyway…. Sautee 2 cups kale and one chopped onion in bacon grease and/or olive oil. Add about a cup of chick stock. Cook until the liquid in nearly gone. Enjoy with a gooey grilled cheese sandwich on crunchy bread! Easy and Delicious and Very Healthy! No apologies.